1) The lotus feet of our spiritual master are the only way by which we can attain pure devotional service. I bow to his lotus feet with great awe and reverence. By his grace one can cross the ocean of material suffering and obtain the mercy of Krishna. 2) My only wish is to have my consciousness purified by the words emanating from his lotus mouth. 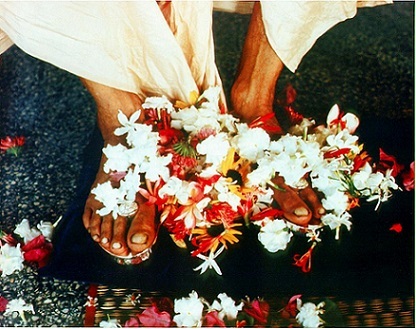 Attachment to his lotus feet is the perfection that fulfills all desires. 3) He opens my darkened eyes and fills my heart with transcendental knowledge. He is my Lord birth after birth. From him ecstatic prema emanates; by him ignorance is destroyed. The Vedic scriptures sing of his character. 4) Our spiritual master is the ocean of mercy, the friend of the poor, and the lord and master of the devotees. O master! Be merciful unto me. Give me the shade of your lotus feet. Your fame is spread all over the three worlds.